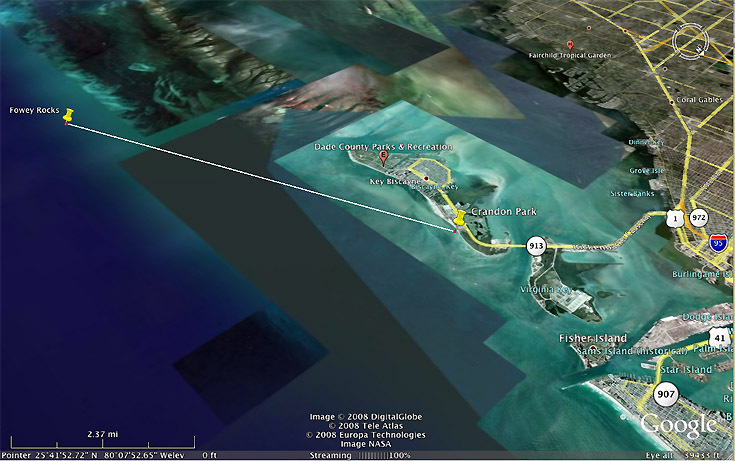 Miami Kiteboarding is organizing a long distance race this weekend from Crandon Park to Fowey Rock. Tentatively: SATURDAY MARCH 1ST , if wind allows. Stay tune to this forum for any updates according to wind direction and strength. RIDERS MEETING at 10.00 am sharp in order to start at 11.00 am. 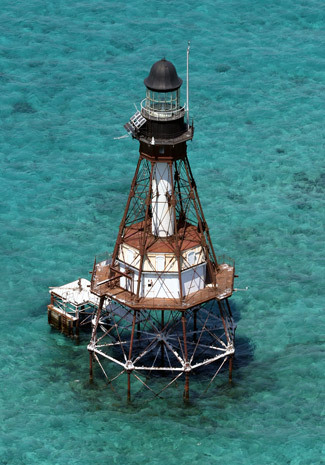 CRANDON PARK KITEBEACH to FOWEY ROCKS located 6,5 miles South East of Key Biscayne light house. The race is aproximatively 15 miles long. Expect chops , currents and ocean conditions as we are rounding Fowey Rocks Beacon right on the edge of the Gulf Stream. 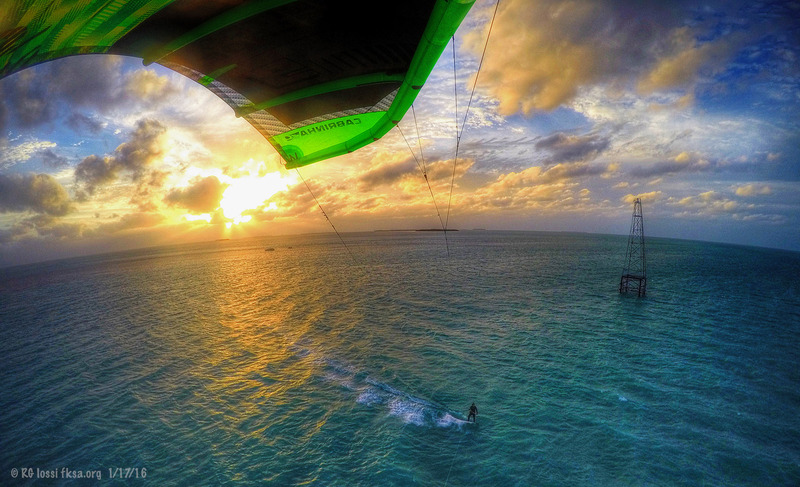 Miami Kiteboarding will provide 2 chase boats to ensure safety and close assistance to riders, as well as images. Any photographers / cameraman with a proper camera are welcome to join onboard. The wind forecast according to www.ikitesurf.com is very favorable for now and predicts NE winds. This is pretty much a Reach tack back & forth. Although tight reach on the way out and broad reach on the way back , especially if the wind is switching more Easterly. Directional boards are usually better to perform well in speed for this type of race, however ANY type of boards are welcome to be used during the race . This race is open to Men, Women, Youth ( Under 18-year-old with parents approval sign-in the day of the race) and Senior ( over 45 year-old) riders. Each categories will have a designated winner and each contestant will be attributed points according to a score system for future races next months. Ph/ 305 401 8885 ask for Patrick or Chris, but only if u can't understand this post . -	CONTESTANTS will have to REGISTER and SIGN-IN ON THE BEACH TO OBTAIN A NUMBERED PURPLE STREAMER to be attached to your BACK PIGTAILS. -	The STARTING LINE will be POSITIONNED 300 ft AWAY FROM THE SHORE . -	ANY CONTESTANT ENTERING THE SWIM ZONES WILL BE AUTOMATICALLY DISQUALIFIED. -	NO CONTESTANT CAN KEEP ON RIDING IN CRANDON after the race until they RETURN the purple Streamer. -	If you plan on riding in Crandon after the race, you must then SIGN-IN the DAILY RIDERS SHEET to get the usual PINK STREAMER. 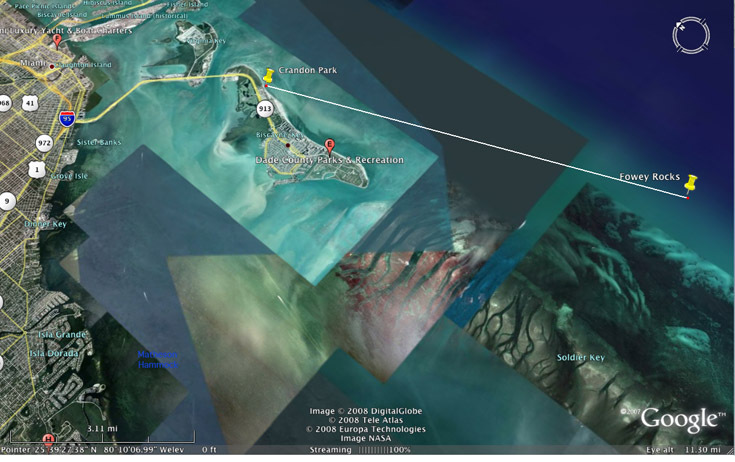 As you know only 25 kites can be on the water simultaneously when riding in Crandon Beach. -	There will be NO TOLERANCE THAT DAY since we have a North East wind blowing toward the swim zones. Any riders ending downwind MUST activate the Safety and retrieve his kite BEFORE entering the swimmers area. It’s going to be a tough job for our team to control the amount of kites on the water after the race, so we really need your smart and courteous cooperation on that particular day or this may be the last event we ever run in Crandon . This 2008 FEBRUARY race is the first one of a MONTHLY EVENT WHICH WILL LEAD TO AN ANNUAL CHAMPIONSHIP. Meaning that each rider attending this day will get SCORING POINTS . The HIGHEST SCORED RIDER will BE DECLARED CHAMPION at the end of the 2007-2008 season. 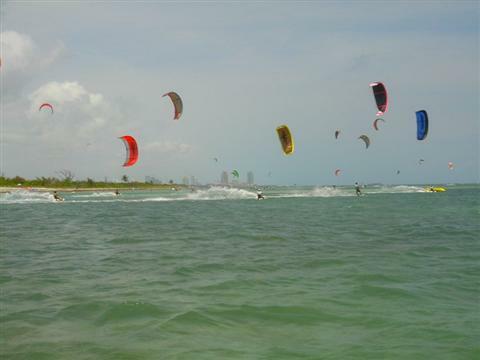 This is a possible attempt to launch a FLORIDA KITESURFING CHAMPIONSHIP where each race in our State of Florida can be part of a global points system to determine a Champion in each categories : Men , Women, Under 18-year-old, and Seniors … either in Racing or Freestyle contests that are ran all along Florida . MKB will not run our usual advanced Downwinders and Taxi service to Stilltsville flats this day, since we will use our Kiteboats for the race. Sunday downwinder is still on in the afternoon and the Sandbars taxiboat for beginners-only in the morning. Last edited by RickI; 02-27-2008 at 09:54 AM. I added some images to your post. Sounds like a blast. NWS is favoring Sunday over Saturday at this point although weather wise the weekend is still a long ways off and things can readily change. Hope it comes together with epic conditions on Saturday. This doesn't sound like a piece of cake at all. There may be quite a bit of tacking involved and hanging in for the long haul. A lot will come down not only to the wind speed but more importantly the direction. The more northerly or southerly the wind, the harder the making to windward might be. I wish I was going to be able to come this weekend, sounds like a hoot! Last edited by RickI; 02-27-2008 at 11:10 AM. it does currently look like Sunday could be very good. this is going to be a great time. i can tell you that the first part of the race will be pretty easy for regular foot riders, but switching to left foot forward after hammering the other tack for 7 miles will be hard, especially if it's broad on the way back. Give the predicted wind direction i would think that both twin tips and directionals will work well. Just checked the NWS zone forecast for Miami and the one just south. The next zone south often applies to the Miami Flats and on the way to Fowey Light. It is still a crap shoot this far out and won't know til that morning how valid the forecast for the zone to the south might be. If you had to wish for a wind direction for an easier run what would it be? Not that you are looking for an easier run to be sure, ha! The NE to E might be fairly ideal for a beam reach, if it happens?! NORTHEAST WINDS 10 TO 15 KNOTS. SEAS 2 TO 4 FEET. CHOPPY IN EXPOSED AREAS. SLIGHT CHANCE OF SHOWERS. WATERS CHOPPY IN EXPOSED AREAS. SLIGHT CHANCE OF SHOWERS. NORTHEAST TO EAST WINDS 15 TO 20 KNOTS. SEAS BEYOND THE REEF 4 TO 6 FEET. SEAS HIGHER IN THE GULF STREAM. SEAS INSIDE THE REEF 2 TO 3 FEET. NEARSHORE WATERS CHOPPY. EAST WINDS 15 TO 20 KNOTS. Definetly motre favorable for this sunday. TO BE CONFIRMED BY THURSDAY AND AGAIN ON FRIDAY. if the High that is passing over us starting on wednesday doesn't moves too fast , we should be good for 15-2O knts out of the E- NE. If it is not ran this weekend , we can easily postpone for next weekends or until it's good. In ANY CASE the meeting and START time will be THE SAME , whatever the day is choosen. SO FAR AT THIS PRECISE MOMENT WE OPT FOR A SUNDAY START. Right it's a long tack on each leg. that's why we put the boats on the water for close assistance and safety. But make sure to get some water ( camel bag) and a solid breakfast in the morning. The fleet may have to tack according the wind direction, we have back up plans if it shift too early or too much southerly on that day. We'll try to get some aerial shots as well as well as a video thanks to a cameramen full time on board. In Need of Directional Board? This should be a great time so long as the wind cooperates! 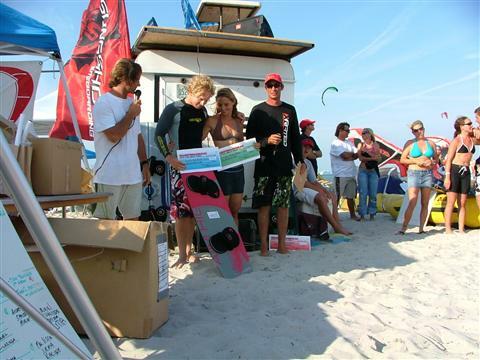 Anyone who prefers to use a directional board, or big boards for the race The KiteShop will bring all demos to the beach the morning of the race. Thee include Cabrinha quad, North Rocketfish, plus some other larger boards. Come try them out early! Kites are available for race as well!